The Two Sides of Ana: Episode 61 | TeleNovela Channel - Bringing you closer to lifes drama. Rafael tells Humberto, Vicente and Ignacio that Marcia is actually Ana Escudero. Ignacio perceives Ana’s rage as insanity because of her family’s death. 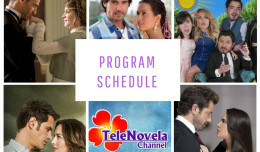 Vicente vows not to tell the truth since she used him to get back at Ignacio. Rafael demands an explanation from his family about Fabian’s accident. Meantime, Graciela is found unconscious and unresponsive.